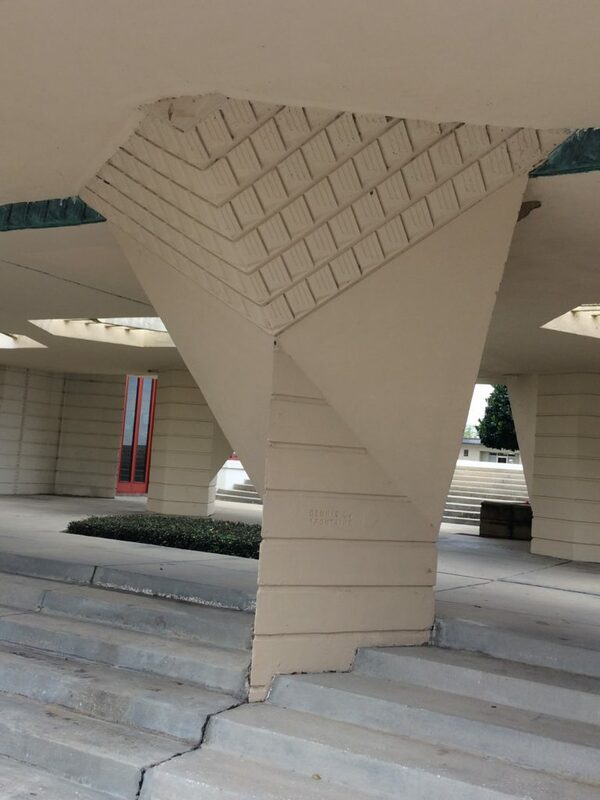 A recent winter escape to Florida introduced me to Frank Lloyd Wright’s last and largest design project, one that speaks to gardeners as well as architecture fans. The esplanade (a covered walkway) provides more than a mile of links between buildings on the campus. 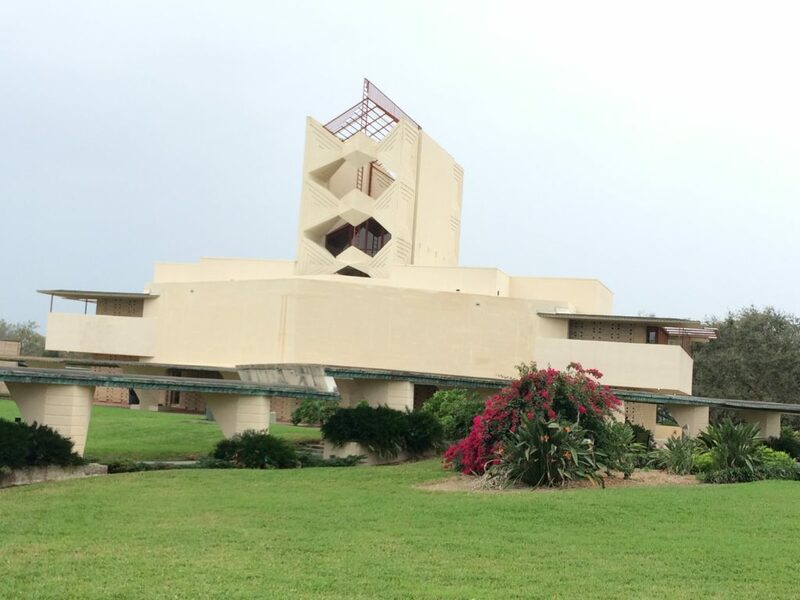 In the late 1930s, Ludd M. Spivey, president of Florida Southern College decided he wanted to transform the struggling college of 300 students into the “college of tomorrow.” It was a big dream for a college where the harvest from the campus orange groves was an important source of revenue, but Spivey had a vision and he approached Wright about designing a campus for the school. Wright visited the college in Lakeland, halfway between Orlando and Tampa, surveyed the landscape and the orange groves and said, yes. The partnership would last 20 years and result in the largest collection of Wright-designed buildings in the world. If you are ever in the area, take time to visit. 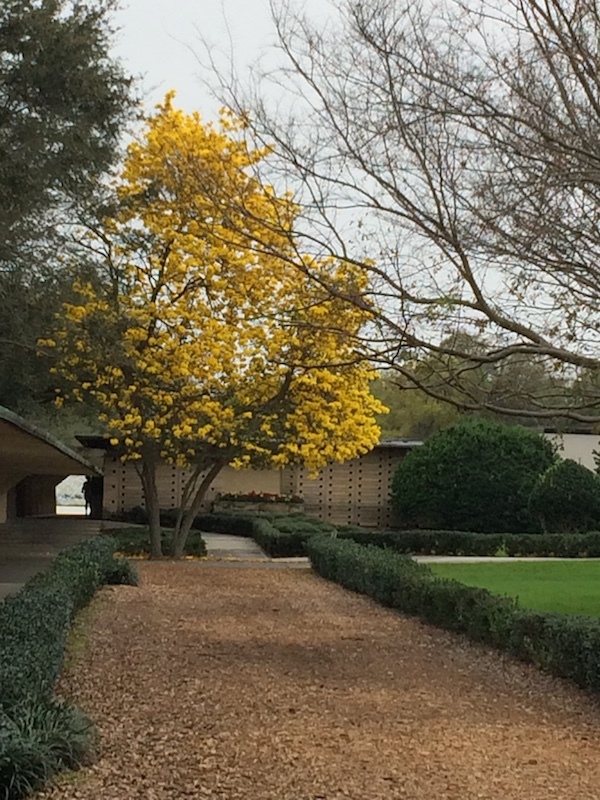 The pillars along the esplanade were inspired by the orange trees that originally grew on much of the campus grounds. Wright famously said, “Stay close to nature. 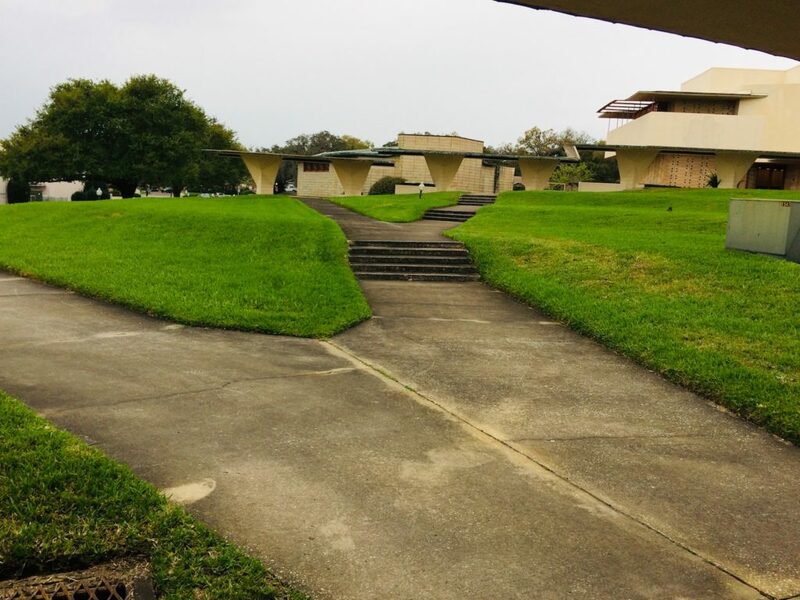 It will never fail you.” For his campus design, the natural features of the existing landscape—a lake, rolling terrain, those orange groves—echo through the buildings and the amazing esplanade that connects them. 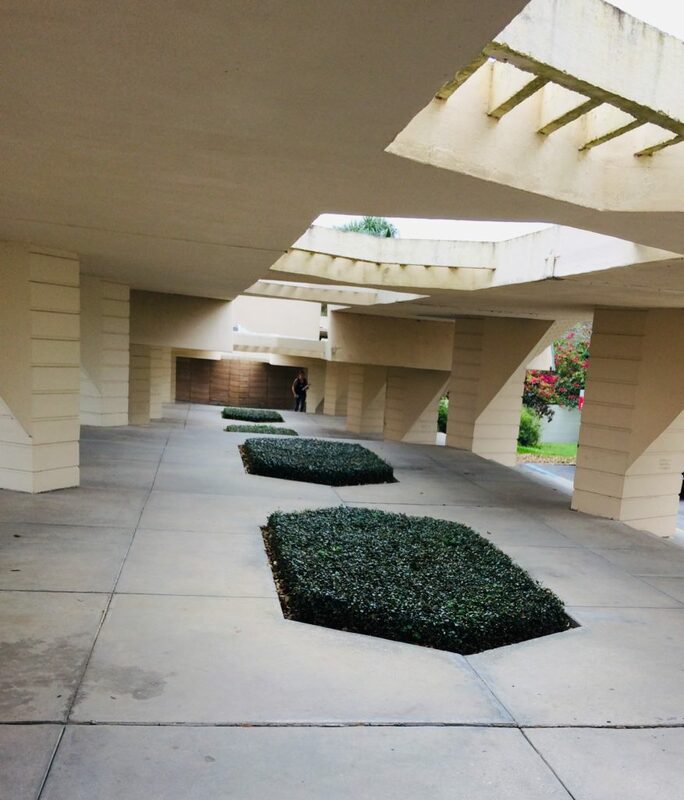 Wright said he wanted the campus to be like a “child of the sun.” Even on the very gloomy day I visited, the massive windows, light-colored stone work—which resembles Florida sand—and repeating beads of glass in the walls of many buildings bring in light and color. Each pillar of the esplanade is a stylized orange tree, with a trunk, branches and squares like fruit. Wright placed the pillars 17 feet apart, because that’s how far apart orange trees are planted, according to the extremely knowledgeable guide who led the campus tour. Sidewalks merge with each other like rivers. Wright kept the grade that was original to the site, and the steps on the walkways give visitors a sense of walking the rolling hills. Walkways step down at each change of grade in the landscape. Sometimes walkways flow together, almost like streams joining a larger river. You seem to flow from building to building, guided by the covered walkways. Garden Design Takeaway: Don’t fight your site. I’ve learned this over and over. Water’s going to flow where it wants. You can’t plant shade-loving plants in sun or sun-lovers in shade. Don’t fight the site. One of Wright’s central ideas was the concept of compression and release. Many of his spaces feel tight. The ceilings are low and the lighting is dim. The idea is to move you into the place he wants you to be: that big central living room, the light-filled sanctuary of the chapel, the bright reading room in the library. That’s the release. Gardeners use this idea often. We create narrow passages or plant trellises with vines to create enclosed spaces. These feel cozy, but they also add to the ta-da moment of stepping into that large garden room, lush with color and texture. I asked our guide if Wright was involved in determining plantings for the campus, and she said he was not. However, in his residential properties at least, he had very strong opinions about trees, views and plants—including once ordering the removal of an oak tree that blocked the vista he wanted! 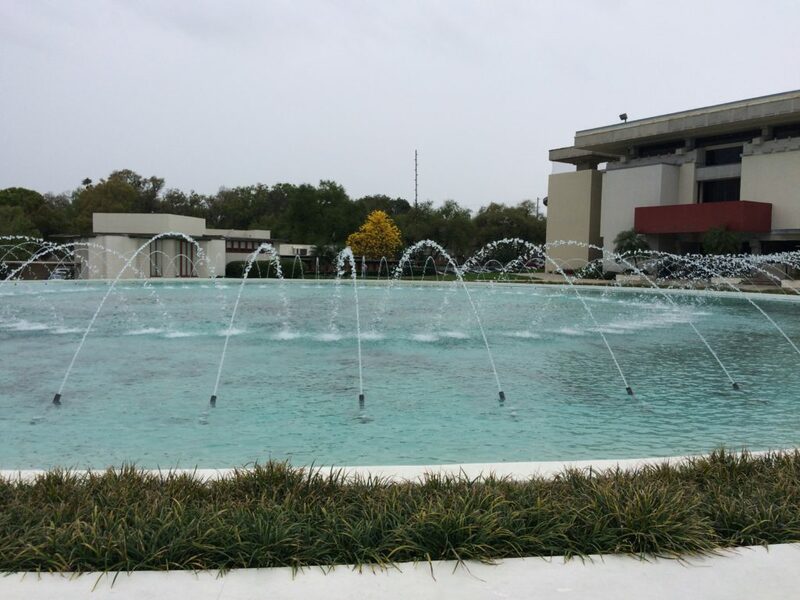 Florida Southern has done a great job of creating focal points and plantings that enhance the architecture. (The school has a significant horticulture program.) We happened to be there during the bloom time for what I believe is the Tabebuias tree—which was striking with its yellow, petunia-like blossoms. The tree has a fleeting bloom time, I was told. It’s likely it lost all of its lovely flowers in the deluge that came down as we made our way back to our rental in Sarasota. I love to visit gardens while traveling. And, this fascinating campus had ideas for architecture fans and gardeners alike. The stunning chapel on the grounds of the Florida Southern College campus. When the jets are on full power, they create a dome of water 40 feet tall!